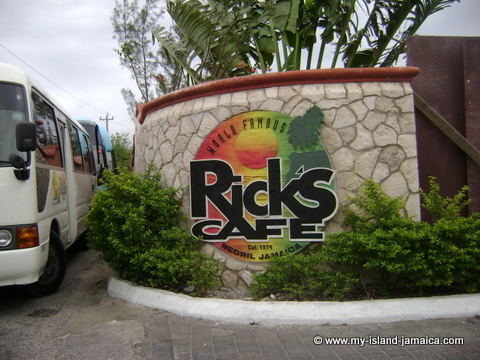 In planning your vacation ensure that visiting Ricks Café Negril is on your list of planned unforgettable Jamaican memories (Ask your tour guide). Rated Number 10 on the Caribbean Travel and Life Magazine’s "All Time Ultimate Destinations List", the Rick’s Café experience can either be an all day event or the perfect closer to your day. The Richard Hershman founded establishment has been around since 1974 and offers so much more than the awesome uninterrupted view of the sunset. 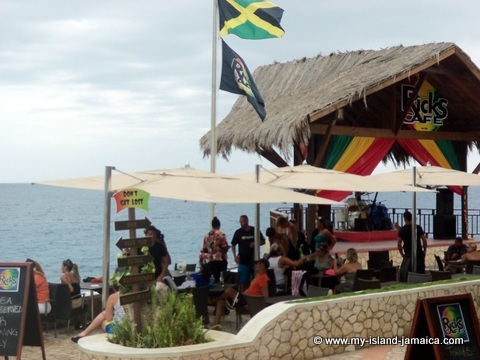 The Rick's experience also includes enjoying Jamaicans only cliff side pool, some good food, and endless drink menu (alcoholic and non-alcoholic), world class diving and of course, local connections. 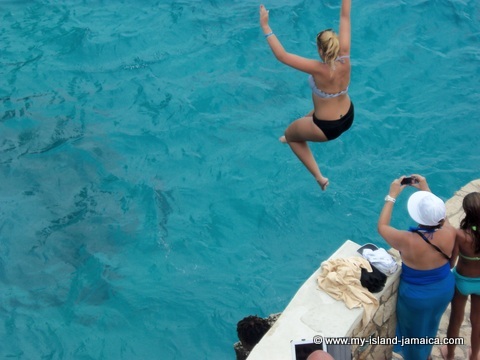 Wanna See A Live Cliff Jump? Ricks Café runs a full restaurant with offering from finger foods to Filet mignon. And to "wet your whistle", The Caribbean Travel and Life Magazine listed Rick’s Café’s bar as one of the ten best bars in the world. Pulsating reggae rhythms radiating from the “Sea Breeze band” (Rick’s resident band) helps to maintain the warm Jamaican vibe throughout the day. Spend a lazy day lounging in a cozy cabana around Jamaica’s only cliff side pool, soaking up some sun and the amazing backdrop of the warm turquoise blue Caribbean sea. Or just watching the locals and tourists alike getting involved in the happenings at the café. Feeling adventurous? 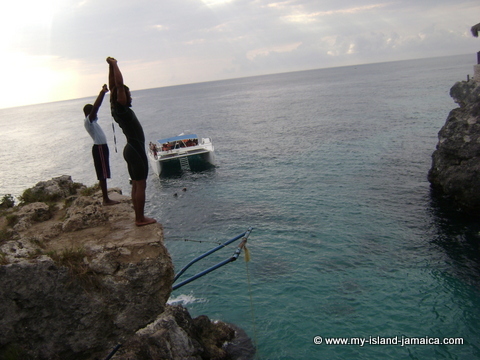 Take the plunge and feel the rush of adrenaline as you dive from either a cliff side platform or a tree (yes an actual tree) into the inviting waters of the cove! Or just watch the locals show off their gymnastic skills from heights of up to 35 feet! And by the way a rope swing is available for those persons who would rather not plunge from the platforms. So if you are a professional diver or brave enough for the challenge by all means indulge. Remember however that your safety is first and foremost, your responsibility. Ricks Cafe in fact, makes it rather clear that diving at the property is done at your own risk, this is not an activity that is sponsored by the company. Yes Rick’s Café has a lot to offer, but if you should ask anyone of the hundreds of persons who converged at the café day after day their reason for coming, the overwhelming majority of them will tell you that it’s for the amazing sunset. 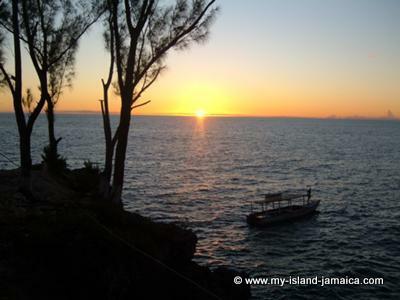 Said to be one of the best places in the Caribbean to view the sunset, locals and tourist alike, travel for miles across the island to experience the magic at Rick's Cafe. I had the pleasure of shearing this with my husband some time ago; it was simply astounding! As it draws closer to 6:30pm EST, everyone on property starts to move closer to the bar area. The energy in the atmosphere is now amplified and charged with anticipation, the band has increased its tempo as if spurring on the sunset. Then there is a hush over the crowd as we wait with bated breaths eager to experience the magical moment when the sun kisses the horizon and explodes in myriads of orange, red and blue hues. Then it takes its final bow and disappears with its shine. And as if released from a spell the crowd breaks out in applause, showing their appreciation for yet another perfect sunset at the Ricks Café Negril Jamaica. Read Catha Falling Star Gardens Hotel & The Town of Negril, Jamaica. 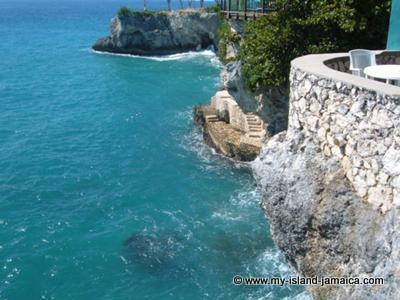 Return to Places To Visit In Jamaica from Ricks Cafe Negril Jamaica. Return to My-Island-Jamaica.com HomePage from Ricks Cafe Negril Jamaica.